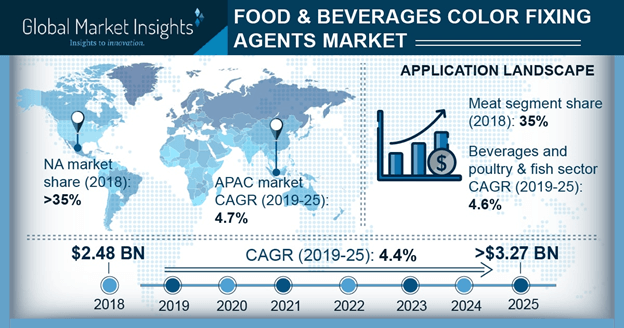 Global F&B Color Fixing Agents Market size is forecast to exceed USD 3.27 billion by 2025; according to a new research report by Global Market Insights. Global F&B color fixing agents market will be driven by rapidly growing beverages industry. Product demand in beverages industry is projected to grow with a highest CAGR during the forecast period. This can be attributed to the rapidly growing beverages industry across the globe. Increasing disposable income and changing eating habits are propelling the beverages industry growth from past few years. Food & beverages color fixing agents demand in bakery application is projected to grow with a healthy CAGR. It is used in bakery as a food preservative to extend shelf life and preserve the taste. Poultry & fish was another major product application segment in 2018 and projected to grow with a healthy CAGR during the forecast period. This can be attributed to the rise in consumer awareness about health nutrition. According FAO global fish production in 2011 was 154 million tons which surpassed 175 million tons in 2018 and forecast to grow with a significant CAGR in near future. Color fixing agents in fish are used to preserve the taste and color of fish, due to high product demand from poultry and fish application F&B color fixing agents market is forecast to grow with a rapid CAGR in near future. However, stringent regulations associated with product food application shall hamper the food & beverages color fixing agents market growth over the forecast period. Product usage is regulated by the various regulation agencies such as FDA and FSAI. These regulating authorities regulates the product presence in final product. In addition, cost associated with the product manufacturing and technology related to it may have negative impact on F&B color fixing agents market during the forecast timespan. Sodium nitrite was having the largest share in F&B color fixing agents market in 2018 and accounted for over 45% of the overall demand. This can be attributed to the availability of the product and high usage in meat industry. Increasing demand for processed meat shall drive the sodium nitrite food & beverages color fixing agents market during the forecast timespan. Product demand in beverages and poultry & fish application segment anticipated to grow with 4.6% CAGR by 2025. Prominently growing sea food industry anticipated to create more growth avenues for food & beverages color fixing agents market. The growth in fish market can be attributed to the innovations and variations in seafood dishes and increasing proteinaceous fat-free food demand across the globe. North America held the largest share in F&B color fixing agents market in 2018 and accounted for over 35% of the overall revenue in the same year. Matured bakery and growing poultry & fish markets in the region shall fuel the product demand during the forecast period. Asia Pacific food & beverages color fixing agents market shall grow with a highest CAGR of 4.7% in near future. Rapidly growing meat and poultry & fish industry in the region will drive the food & beverages color fixing agents market over the forecast timespan. Many large multinational, mid-scale and small-scale vendors are operating in the global F&B color fixing agents market. Some prominent product manufacturers operating in the industry are Merck KGaA, BASF SE, AkzoNobel NV, America Elements, Aldon Corporation, Naturex, GFS Chemicals Inc, Mitsubishi Chemical Corporation, Spectrum Chemicals, Old Bridge Chemicals, Sonac and Yara International.